Starting with a Calendar Note, Fall’s traditional start of the new judicial term brings the annual crop of Red Masses -- the centuries-old rite invoking the Holy Spirit on the deliberations of the courts. While the custom has spread widely over recent decades in the English-speaking world, the best-known of the annual liturgies comes Sunday in Washington as a quorum of the Supreme Court -- led by Chief Justice John Roberts, only the second Catholic to serve as the nation’s top jurist -- fronts the pews at the capital’s 58th edition of the Mass in St Matthew’s Cathedral. Always held on the Sunday before the first Monday in October, the DC Red has become the judicial year's unofficial start for the Supremes, whose term begins the following morning. An unprecedented six Catholics now sit on the nine-member high court. Organized as ever by the capital’s John Carroll Society of Catholic lawyers with Washington's Cardinal Donald Wuerl (above, with Roberts) presiding, the day’s key tone-setter tends to lie elsewhere... namely, in its choice of homilist -- a role that, over recent years, has gone to top-tier prelates with names like Ted, Tim, Foley, DiNardo, O’Malley, and Augustine (DiNoia, of course). This year, however, the pulpit duties fall to a star still on the rise: Archbishop Peter Sartain of Seattle, 59 years old, and yet to complete his first year in the post. Known for a particularly intense spirituality, the low-key Memphis native has earned high early marks in the famously-progressive Seattle church for his mix of warmth, simplicity and an openness to dialogue. 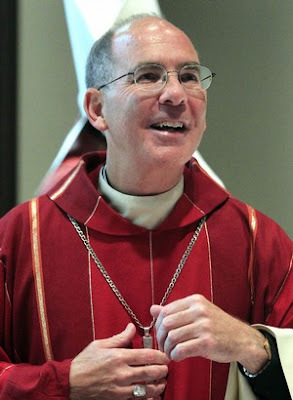 First named bishop of Little Rock in 2000, then transferred to Joliet in 2006 before being sent Northwest last fall, while Sartain has not held a USCCB chairmanship to date, regard for the Emerald City prelate runs high on the bench. Accordingly, the Seattle move has done little to tamp down speculation on an even more eminent future for the archbishop beyond the Space Needle; among others, one very senior prelate has reportedly spoken of seeing the cardinal of his boyhood in the Rome-trained sacramental theologian. Either way, with the Red Mass nod marking Sartain’s first turn on the national stage -- and a conspicuously high-wire one at that -- the result bears watching. Then again, if any among the bench could be expected to bring the right stuff to the bright lights, the lone American bishop who grew up around the corner from Graceland might just have a unique way of going about it. In response, yesterday Archbishop Timothy Dolan announced the establishment of an ad hoc committee of the bishops dedicated to addressing challenges to religious freedom. The new arm will be headed by Bishop William Lori of Bridgeport, himself the veteran of a successful fight against a 2009 Connecticut proposal that would’ve dictated financial norms of oversight for the Catholic church alone in the wake of embezzlement scandals on the part of parish priests. In a departure from the frequent polarization of the American Catholic scene on matters of the public square, the conscience push has notably attracted broad support, extending to quarters which have prominently sparred with the bishops over recent years. Among others, the campaign against the proposed contraceptive regulations has been backed by the Catholic Health Association -- the lead church entity to support last year’s Federal health-care overhaul in defiance of the bench -- and the president of Notre Dame, Holy Cross Father John Jenkins, whose submitted comment warned of an “impossible position” for Catholic organizations were the benefits rules to be implemented. A Catholic, Sebelius is the daughter of a Notre Dame alumnus and faculty member. 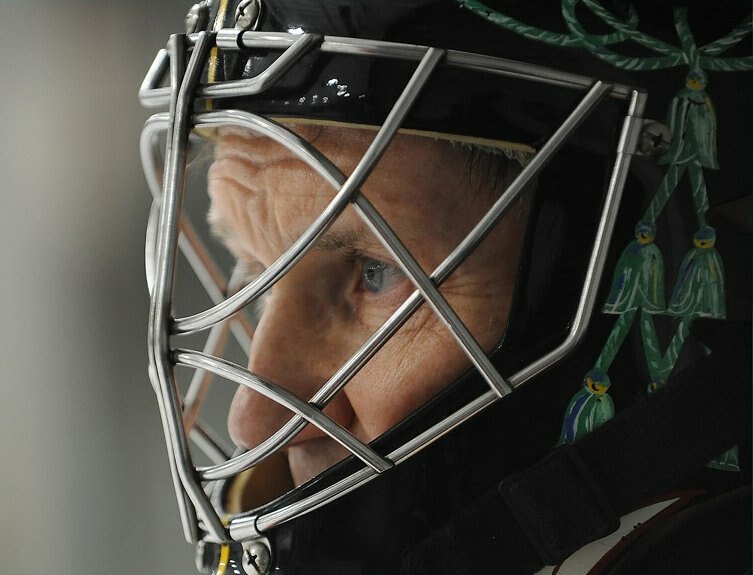 Between the Red Masses and the start of NHL season, it's fairly natural for the "Holy Goalie" to come to mind... and this year, with even more reason than most. By his own admission, Bishop Thomas Paprocki of Springfield gets his "enjoyment from standing in front of a hockey net and having people shoot pucks at me at 100 miles per hour." A canon and civil lawyer alike -- who, as a young priest founded (and still heads) a free legal clinic for his hometown's indigent -- the Chicago-born prelate's zeal beyond the net was further evidenced last year, when his installation in Illinois' capital conspicuously took place on the feast of the martyred English Saints Thomas More (now the patron of lawyers and politicians) and John Fisher (the cardinal beheaded for opposing Henry VIII's claims to primacy in the English church). Bottom line: "His Goalieness" isn't exactly the milquetoast sort... and his latest turn's only reaffirmed it. 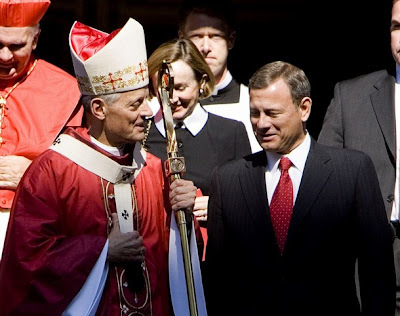 After Paprocki's Thursday night post-Red Mass speech to Houston's Catholic judges and lawyers, it didn't take long for word of a barnburner to light up the wires. Given in the presence of H-Town's two archbishops -- Cardinal Daniel DiNardo and his predecessor, the former USCCB chief Archbishop Joseph Fiorenza -- the barrister-bishop laid out possibly the most searing sketch of the national landscape on religious freedom, and where the path undertaken could lead. And in response, a raucous standing ovation was had. A longtime marathon runner, the bishop'll be taking part in his 18th 26-miler later this month. Keeping with his longtime custom, Paprocki raises funds for a charity with the runs; this year's proceeds are going to pro-life efforts.